As the North American offshore wind model evolves, it is clear that fit-for-purpose, Jones Act compliant and Arctic ready tonnage will need to be part of the equation. If so, we've got that box checked, with a little help from Europe. As of September 2018, the Walney Extension off the United Kingdom is the largest offshore wind farm in the world at 659 megawatts. There are at least 70 major wind farms, each with hundreds of wind turbines, each generating as much as 10 megawatts in offshore England, the North Sea, Russia and China. Across the big pond, in Canada, the offshore wind industry is even less developed than in the U.S. The first ever project, the 180MW St. George's Bay project, is still in the development stage. The United States has one little offshore wind farm, Rhode Island's five-turbine, 30-megawatt Block Island project. But the developer, Deepwater Wind, shipped the five General Electric nacelles across the Atlantic aboard the Fred. Olsen Windcarrier and then used the barge for installation of the full turbines at Block Island, thus avoiding Jones Act restrictions. U.S. flagged feeder barges assisted by transporting the towers and blades from shore. The scope also included marine engineering, lift engineering, general operations planning, the design, fabrication and mobilization of grillage and sea fastening and lift supervision. Earlier this year, the project's developer, Deepwater Wind, was acquired by Danish power company Ørsted, hinting at what was to become the "let's learn from Europe" movement. Meanwhile, the U.S. Department of Energy predicts around 22,000 MW of offshore wind from 10 states by 2030 if the U.S. can get past the Jones Act barrier or charter European designed offshore wind vessels. Inevitably, so it seems, American wind farm developers have finally accepted the vast experience and innovation of Norway and Denmark and adapted it to Jones Act construction of European vessel designs. The first fit-for-purpose wind support vessel in fact emanated from the UK, whose design was used to construct the first US-built and operated offshore wind farm crew transfer vessel. The Atlantic Pioneer, built in 2015 in Rhode Island by Blount Boats, is a 21 meter aluminum vessel that was designed by South Boats, a pioneer in designing and manufacturing crew transfer vessels. Prior to this historic achievement, South Boats had built approximately 81 crew transfer vessels for the European offshore wind sector, servicing wind farms throughout Europe. Continuing that leadership from the Continent, last October, Orlando, Florida-based Aeolus Energy signed an agreement with Norwegian shipbuilding group Ulstein Design & Solutions, B.V. to design the first Jones Act compliant service vessel for the blooming U.S. offshore wind market. Aeolus says the purpose-built vessel, known in the industry as a Service Operations Vessel (SOV), will be the first among a fleet of vessels to support the full scope of offshore wind farm operations from installation through decommissioning of turbines. Additional plans for the fleet include cable ships, crew transfer vessels and floating offshore hotel ships. "The design and ultimate construction of these vessels will result in significant job creation and is a demonstration of confidence in the American shipbuilding industry," said Elia Golfin, CEO of Aeolus Energy Inc. "We are excited to be working with Ulstein, an established market leader in vessel design for offshore wind. We look forward to pushing the envelope in the offshore wind industry where Jones Act-compliant vessels are concerned." "Ulstein is proud to have been selected as design partner by Aeolus for developing the United States' first purpose-built SOV vessel," said Tore Ulstein, deputy CEO of Ulstein. For the design, Aeolus has selected Ulstein's proven SX195 SOV, which will be fully customized to Aeolus's specifications and U.S. Coast Guard requirements ahead of bidding by qualified American yards. The SX195 is 93 meters in length, with a beam or 18 meters. It weighs 3,200 tons with a maximum draught of 6.0 meters and a maximum speed of 13 knots. It will accommodate 80 to 120, including crew and technicians, because of its unusual massive bow. "The project starts with customizing the SX195 design, to optimize the new walk-to-work vessel for operations in U.S. offshore wind farms, including featuring the patented X-BOW and X-STERN hull shape," Ulstein said in a press release. "The X-BOW was developed during 2003-2004 - one of the latest tough periods for the offshore industry - and revealed in 2005, together with the contract for the first vessel, 'Bourbon Orca', an anchor handling tug supply vessel for Bourbon Offshore Norway," said Ulstein Group CEO Gunvor Ulstein. The beginnings for this bow design can be traced to the late 1990s and the collaboration between Damen Shipyard, a commercial and military vessels builder, and the faculty of Delft University of Technology, the U.S Coast Guard and the Maritime Research Institute Netherlands (MARIN). This design was specifically developed to improve the sea keeping at high speed and ensuring 100 percent operability in the North Sea at 50 knots with a 50 (164') meter patrol boat, according to Jaap Gelling, Product Director of Damen. In 2016 the X-STERN was introduced. This aft design element is a natural evolvement of the X-BOW, and allows computer assisted bridge operation fore and aft. Both the X-BOW and the X-STERN are patented and have won several marine industry awards worldwide. In latter years the X-BOW was introduced on 41 vessels for the offshore renewables industry and for expedition cruise including the Lindblad Expeditions / National Geographic expedition cruise vessel, the National Geographic Endurance. Ulstein Verft, Norway is constructing the vessel due to launch in 2020. The Endurance was named in honor of polar explorer Ernest Shackleton's ship. It is designed to navigate polar passages year-round while providing exceptional comfort. It will safely explore uncharted waters and new latitudes, including Northeast Greenland, remote Jan Mayen Island, the Northeast Passage, and more, according to National Geographic. The Endurance accommodates 126 guests in 69 spacious cabins-all of which face outside and have large windows or balconies, private bathrooms, individual climate control and an expedition command center. Miami-based SunStone Ships and China Merchants Industry Holdings have also signed a framework agreement to build four expedition ships with options for six more with the X-BOW. The 104-meter vessels will be constructed by China Merchants Heavy Industry (Jiangsu) Co., Ltd. near Shanghai, with the design, equipment and management supplied by Norway's Ulstein Design & Solutions. The ships will hold 80 to 95 passenger cabins and be rated Ice Class 1A or Polar Code 6. The first delivery will be in August 2019, with one vessel to follow every six months after. 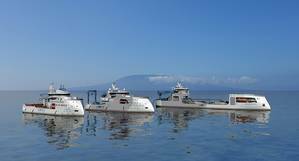 Ulstein has produced 100 of these patented X-bow ships. For the Aeolus Energy SOV, the aftermarket additions from Uptime International could include a newly designed active motion compensated gangway and an adjustable pedestal integration which will be mounted towards the elevator tower. The interaction between gangway and vessel will enable personnel and cargo transfer through the gangway in addition to the gangway also being used as a crane. A sign of its growing importance in the 'Walk to Work' market is evidenced by DNV GL's publication in June 2015 of an industry guidance document for walk-to-work vessels, so called because neither skiffs nor helicopters are employed for ship-to-structure transfers, only gantries. The International Maritime Construction Association developed a consensus on the optimum design and configuration of boat landings for accessing wind turbine foundations from crew transfer vessel gantries, to standardize the structural design and strength with the aim of reducing operator costs and increase safety of personnel when transferring to these offshore structures. There are half-dozen choices in Europe now for walk to work gantries. They include the Dutch firm Safeway/Van Aalst, Norway's, Salt Ship Design and Osbit Power in the UK. Closer to home, Aeolus' plans for the fleet come as more and more U.S. states, such as Massachusetts, New Jersey, and New York, move closer to having wind farms off their coasts. The Trump Administration has also signaled an eagerness to boost development in the U.S. offshore wind industry, part of the Administration's policy to boost domestic energy production and domestic shipbuilding. As wind farms move into colder and rougher waters one innovation required by the European regulators will be a blessing for offshore wind farm crews transferring from SOV's to wind turbine towers and offshore platforms. And that is the Ampelmann N-type, a proven gantry system that transfers personnel safely in extreme cold weather. Known as the Icemann, it is fully operational in temperatures as low as -28°C, ice, snow, and sea states up to 3.5meters (about 11.5 feet.) It is fully motion compensated on six hydraulic legs, resulting in zero movement of the gangway. Using technology inspired by the flight simulator industry, Dutch offshore technology firm Ampelmann has enhanced the design of its conventional W2W system, employed in relatively benign environments for Arctic conditions on vessels greater than 70 meters. The N-type system, otherwise known as 'Icemann', addresses the combined challenges of sub-zero temperatures, snow and sea spray icing, as well as wind speed, sea state, visibility and vessel movement. It was developed to provide safe access for personnel in remote areas such as northern Russia, Norway and Canada, and parts of the Caspian Sea. The system underwent rigorous testing prior to deployment last August for Sakhalin Energy Investment Company at the Sakhalin-2 field center in the Sea of Okhotsk offshore northeast Russia, and has since performed more than 16,000 transfers, and nearly 1,000 landings. Icemann is fully enclosed and insulated and features a transfer deck for up to 20 people, can rotate 360 degrees, and is controlled from the vessel to ensure flexibility in platform landing locations and directions. It has a maximum gangway length of 32 meters (105 ft), a telescopic scope of 11 meters (36 ft). The advent of North American offshore wind brings with it the need for fit-for-purpose, appropriately classed, ice and Arctic ready platforms, and the safety measures that make it all possible. All of that, and more, is already happening, across 'the big pond.' For U.S. boat builders, the coming boom can't come a minute too soon. And, the learning curve just got a lot shorter.